It was my brother who pointed out to me this month’s most amusing evolution story, in the form of the discovery that the European bison (or wisent) is actually a hybrid of the extinct pleistocene steppe bison (closely related to the American plains bison) and the aurochs, the ancestor of domestic cattle. This hybridisation had been suspected from the sequencing of both ancient and modern DNA, which found that aurochs mitochondrial DNA is present in the wisent, suggesting a hybridisation event. 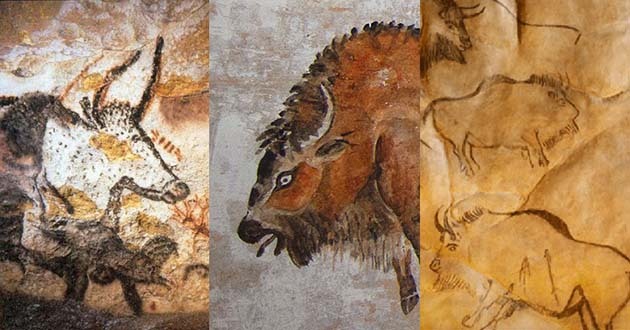 The confirmation of this process in the representations of European cave art, which is seen to transition from a steppe bison type to a wisent type, led some wag to coin the term “Higg’s bison”. This is, incidentally, not the first time that the accuracy of palaeo-art has contributed to our biological knowledge: from it has come our knowledge of mammoth colouration in life, and the zebra-like striations on the shoulders of ice-age horses. 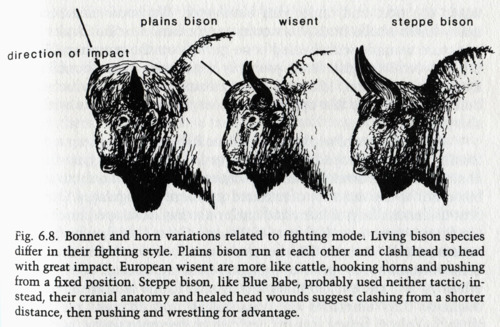 In the light of the hybrid story, perhaps the wisent’s cattle-like fighting style is not surprising, but then the mystery is why the steppe bison differs so greatly from its close American cousin. One has to suspect that anatomy, rather than selection, may drive behaviour: and perhaps cultural behaviour, in turn, moulds anatomical change. There are just too many variables for an adaptive just-so story. But I want to concentrate most on this story as an example of hybrid speciation, which is conventionally said to be rare in higher animals, though it would seem to require more complete knowledge than we have of the genomes of lineages to be able to say that with assurance. Apparently sterile hybrids are known between nearly every member of the Bos genus, the exceptions being those with different chromosome counts (I wonder how those would arise and reproduce successfully, then?). Since the steppe bison and aurochs inhabited the same environment, crosses are not too surprising, although since even a child (or a cowboy) can easily tell that a bison is pretty different from a cow, spontaneous crosses do raise ones eyebrows a little: that animals recognise their own kind is kind of basic to sexual reproduction. What it is that enabled one or more male-bison/female-aurochs crosses to lead to a fertile and genetically isolated hybrid population is unknown, but (reflecting my recent posts) probably also highly contingent and, within the Meaning of the Act, saltational. The “fortuitous” resulting mix of genes and phenotypic traits, however, out-competed the steppe bison despite the latter’s long selective history, and we now have only wisents in the world… it seems the hybrid even outcompeted the aurochs, in its non-domesticated form, now extinct. Aurochs and Steppe Bison apparently evolved in roughly the same time and place, perhaps in India around 2 million years ago, so it would follow that they probably have a common ancestor some time before that, and increasing divergence after that point. But it is a bit difficult to be sure, when we know now that the genetic similarities of their living descendants – wisents and domestic cattle – are at least partly due to gene transfer from the hybridisation event. We propose that because of shared polymorphisms and reticulations, tree topologies are only partially adequate to represent the phylogeny of the Bovini. …the pattern of previously classified bovid clades and sub-clades is not supported, suggesting that recurrent mutations and short internal branches may limit meaningful evolutionary information. To what extent, I wonder, does this evidence actually represent recurrent speciation by multiple hybridization events? Perhaps “recurrent mutations” are distinguishable from “horizontal gene transfer”, but that would seem to depend, given the rarity of actual fossil DNA, on the robustness of the computational models being used – and these are going to be pretty difficult to calibrate from the fossil record. Predictions from cladistics depend on the assumption that clades represent a Darwinian phylogenetic tree (for strictly speaking clades are just comparisons of traits which could have other explanations, even including Linnaeus’ assumption of special creation and the principle of plenitude). It has become the custom, it seems, to correct morphological taxonomy by genetic evidence – but in the case of the Higgs Bison and his cousins, at least, that seems a hazardous process. Genes tell many tall tales, and not all of them are true. Instead there is fossil evidence for a few (even fewer than the illustration suggests) pretty stable species, and the saltational emergence of new ones. Who is to say whether the novel mix of characters that marks human progress was not more the unpredictable result of the hybridization of separately developed traits than simple “descent with modification”? And what about the story of our descent from a chimp common ancestor, on which hangs so much of the modern discussion of everything from animal rights, human violence and sexual morality to the historicity of Adam? Our genetic similarity to chimps is not much greater than our similarity to orang-utans, on a different continent, with which we also have much more in common behaviourally. Is it inconceivable that the waters may be muddied by unknown hybridization events? And might not such events trigger entirely new morphologies and behaviours negating ancestral comparisons? Kaczynski told his class…: “With seven variables you can model any set of data — as long as you can play with the coefficients.” There will be no “unexplained” variation left over to warrant an eighth factor. That’s why big models always seem to fit so well and have large R² values, and the modelers “don’t need” the eighth factor. Except that if you drop one of the other seven and replace it with number eight, you can get another good fit (with different b-coefficients). Many moons ago, TOF read an article in Scientific American, the title and author of the article now escape the keen steel trap of his mind, in which an R² value was improved by adding a variable that was completely irrelevant to the model! The bottom line, I guess, is that whether you buy the traditional but increasingly unlikely scenario that mankind arose gradually and adaptively from a chimp-like ancestry, or whether crossing a chimpanzee with an orang-utan gives you, presto-changeo, Einstein, the whole process is highly contingent, and therefore (in Christian terms) highly dependant on a creative, designing providence. 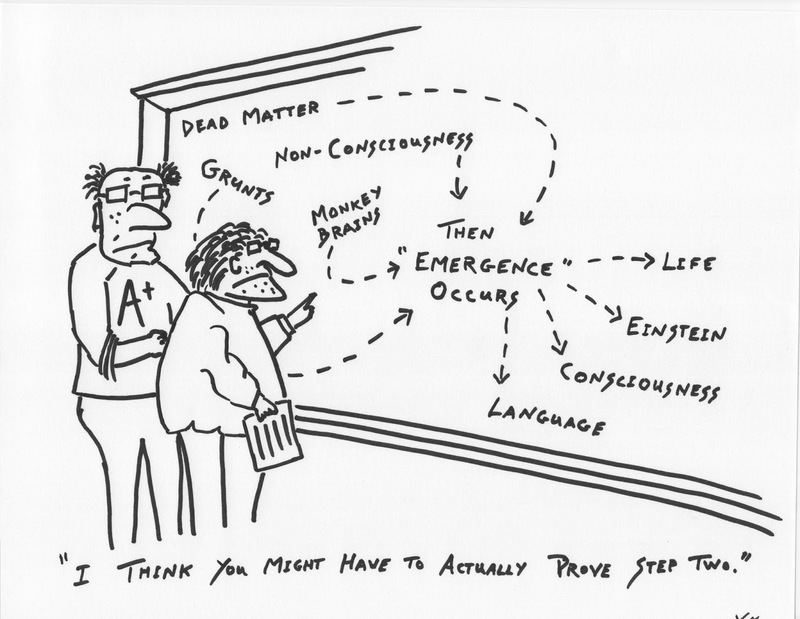 It’s not so much a “Then a miracle occurs” thing, as a miracle being each and every stage. There is so much we simply do not know and the ultimate truth may not make everyone happy – on either side! This thought amuses me. Details even in Genesis are scant. “Let the earth bring forth living creatures” means what exactly? God shaped us from dust first and THEN breathed life into us – does this imply an intermediate step of some type? Is the process similar to the other creature creations up to the “divine kiss” or not? So much is NOT explained yet the end result is certain. Perhaps it is good to contemplate such things as divine mystery, remain humble yet awe-filled, and press on. Mystery will, indeed, continue to abound sufficiently to keep us all more humble before the Lord! I think the “Let the earth bring forth” commands are easily overinterpreted, especially when used as evidence for automous secondary causes (ie the Lord makes the earth capable of spontaneous generation and evolution without further input). In its brief way, it seems to me the words are simply a royal command that stuff should happen. The plants etc come from the earth (not the sky), so it’s natural that the earth should be commanded to bring them forth. But putting them in the subjunctive (“Let it bring forth…”) rather than the imperative (“Bring forth!”) gets rid of any idolatrous notion that the earth is a personal creative agent – the very thing that the “autonomous nature” guys go on to assert. The clay/breath thing for Adam can also, I think, be interpreted too metaphysically. It has a lot in common (John Walton shows) with other ANE concepts of man made from clay plus some divine constituent (god-blood, sometimes). In the Genesis 2 case, it seems legitimnate to picture God making a clay model and imbuing it with his own life, thus making a kind of physical-divine being, suitable to the role of God’s agent on earth. If so, that description would make less sense in the context of the animals, which is maybe why it isn’t used of them. There seems some sense that animal life is of the earth, whereas human life is also of God – for it is “after his image and likeness”. Even so, as maybe you already know, the idea of animals having, or being, “souls” is commonplace in the OT, so that “soul” (“nepesh”) seems more or less equivalent to “life”, and Psalm 104 speaks of animal death as God “taking away their breath”, and of their renewing when he “sends his Spirit” – “breath” and “spirit” being the same word in Hebrew (ruach) and used in parallel phrases. Maybe those two ideas can, without too much violence to the ANE context, be harmonised with the Aristotelian “hylemorphic” idea that I find attractive: life is the combination of material with immaterial form (aka “information”). God is the ultimate source of the information, whatever processes his employs, for all forms of life, making it his gift. In the case of humans, there is the extra dimension that our “form” is the image of which Christ is the stamp. That probably has little to do with the OP, I guess! I certainly didn’t explain myself very well. While I don’t support concordism in interpreting Genesis 1-2 (that it contains all the specific details of how God fashioned the creation), I meant to say that EVEN from such a perspective the details are scant. No matter. FWIW I was thinking of “Them” as over-interpreting, rather than you!